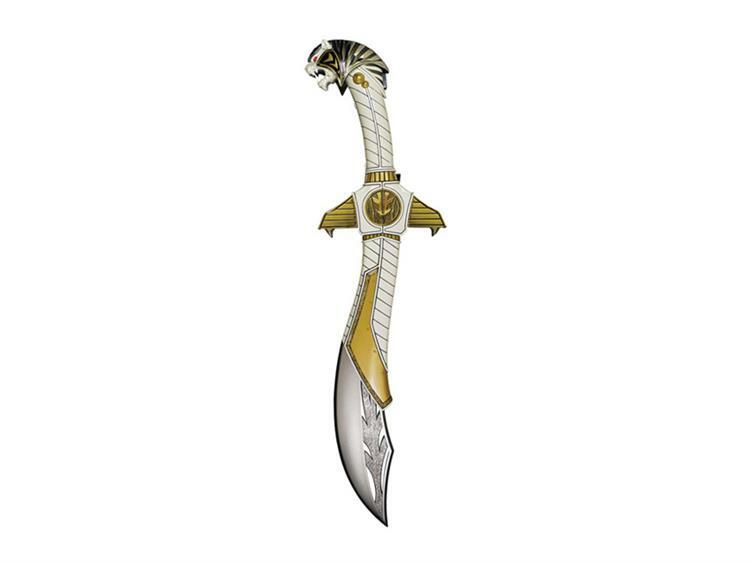 Go back in time to the Mighty Morphin Power Rangers with this White Ranger Legacy Saba Die-Cast Sword Replica! This highly detailed die-cast replica comes with show-accurate speaking Tiger animatronics and also features lights and sounds! Originally wielded by White Ranger Tommy Oliver, this Saba Sword was an enchanted short sword that was able to talk, project energy blasts from his eyes and can fly. Although this Saba Sword can't blast rays from his eyes or fly, it still is made of high quality plastic and die-cast and features show accurate sounds and lights! Be the White Ranger! The sword measures 27-inches in length when extended. The helmet, coin, and gold parts surrounding the coin are die-cast. Requires 2x "AAA" batteries, Included.